Michelle Evans is the president of Mach 25 Media and author of "The X-15 Rocket Plane: Flying the First Wings into Space." Ms. Evans contributed this article to SPACE.com’s Expert Voices: Op-Ed & Insights. From the Wright brothers to the last flight of the X-15 was a steady progression, moving the barriers back on the unknown. Designed in the mid-1950s, the North American Aviation X-15 was tasked to take pilots into the realm of hypersonic flight, exposing the aircraft to speeds and altitudes Orville and Wilbur could never have imagined. The slick, black stiletto eventually took eight of its 12 pilots into suborbital space and achieved velocities in excess of Mach 6. Much of what was learned during the program’s 199 flights was passed on to the space shuttle. The pilots talked about seeing the Earth from near-orbital altitude, whereas everyone from the mechanics to the guys in the rocket shop all rode along vicariously, knowing what they had made possible. To miss a day of work was to miss being part of history in the making. This was true from the first flight in March 1959 all the way through to the last in October 1968. 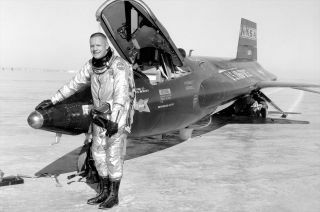 An example of this attitude was how Ralph Richardson, the U.S. Air Force specialist responsible for the X-15 pilots' pressure suits, acquired new parts. The suits were the first full-pressure suits for protecting a pilot in space, and ordering parts from the U.S. Air Force, as was required, could take months — not to mention the mounds of paperwork to get it done. Instead, Richardson’s staff did it themselves in-house at Edwards Air Force Base. It was completely illegal by military standards, but they would take a lathe and label it as an “Injector Nozzle Sizing Tube” and get on with their work. The first was with NASA pilot Jack McKay in November 1962, when he had an in-flight emergency with multiple system failures soon after launch from the wing of a B-52 mothership. The aircraft rolled over during the crash landing, literally coming to rest on McKay’s helmet, compressing his spine. This eventually led to complications that contributed to his death a dozen years later. In June 1967, Pete Knight lost all electrical power and nearly had to eject. His piloting skills saved a valuable research aircraft that the manual said could not be controlled in such a situation. Pete proved the value of having a pilot in the cockpit. But just five months later, Michael Adams was killed when the No. 3 X-15 entered a hypersonic spin on re-entry into the atmosphere, and broke apart high above California’s Mojave Desert. The X-15 was an exciting program that could sometimes be dangerous, but there were also times of a lot of fun and creativity. People played practical jokes, such as a mechanic painting Joe Walker’s X-15 instrument panel pink prior to a flight, or team members freaking out North American Aviation’s chief test pilot Scott Crossfield by making him think a technician was ripping out the cockpit wiring — as a way to get back at Scott for taking away smoking privileges on duty. Parties at Juanita’s bar in Rosamond were the rule of the day after a successful flight, and backyard barbecues with members of the extended X-15 family happened nearly every weekend. It is the people who make the X-15 story come alive. My favorite anecdote came from NASA’s Flight Research Center director, Paul Bikle, who was Neil Armstrong’s boss when Neil flew the X-15. Several books have mentioned Neil’s tribulations with regard to skipping out of the atmosphere during one re-entry because he fixated on his instruments and not his flight profile, but having the perspective for the first time from Bikle, the guy who knew Neil so well and was also in charge of his career, makes this an especially wonderful tale to tell. Not many people know that Bikle, even as one of Neil’s best friends, was ready to fire him after these incidents. He was very happy when the future First Man on the Moon was accepted by the astronaut office in Houston. None of that ever changed their deep and abiding friendship, but Bikle had to do what was best for the X-15 no matter his personal feelings. One of those comes from Milt Thompson, who flew for NASA. Besides being a pilot for the X-15, he was also the first pilot to take aloft the flying aluminum bathtubs known as lifting bodies. Milt was the very first interview I did for the book, way back in September 1983. He holds a unique spot as being not only a test pilot, but also served as the technical adviser for the 1961 Charles Bronson film, “X-15.” I was able to use Milt's role to take on the whole idea of how the media can promote, but also distort, a project like the X-15 — sometimes creating propaganda that can never be achieved in reality. In retrospect, the men of the X-15 program thought of this as the best days of their careers. They all had expected to go on to more advanced spaceflight research —programs that would have truly made access to Earth orbit the routine and provided the safe proposition originally promised by the space shuttle. Unfortunately, that was not to be. If a sea change in our current space program were to take place, to take us back to the way things operated during the X-15 program, we might have people walking the dusty surface of Mars in a few short years rather than the decades now envisioned. The old adage that not knowing the past dooms us to repeat it is not always correct. Sometimes, the past gets lost and we no longer understand how to move forward. The history of the X-15 will hopefully show people what they can accomplish if given the right circumstances. Understanding our past from the very dawn of the Space Age, with all that was accomplished by the X-15 rocket plane, might be the best kick-start we could ever have for the future of space exploration, and moving humanity out to the stars. You can learn more about Evans' research into the X-15 rocket plane program in her book "The X-15 Rocket Plane: Flying the First Wings into Space."